I request the govt of Pakistan to take a fare and sincere interest for the development and education of their poor citizens. It is the pioneer responsibility of the govt of Pakistan to take bold action regarding to this issue. illiteracy decreasing day by day .I hope one day PAKISTAN is just literate country. Factually in correct please. The literacy rate as on 2013 in Pakistan has gone down to 58% from 60%. Actually both of you are wrong, literacy rates in pakistan are 59%. Behind every blue sky there is a silver lining. May Allah grant Pakistan the best among all. Educatiin awareness should also be promoted as for females i have heard a common typical dialogue “haandi roti hi krni ha parh k kia karay gi” and this makes me furious, but being a teacher i guide them a lot. There you go. YOu and your literacy. Its:…behind every cloud there is a silver lining. Behind every sky is open space where pakistan can never go. Please I want to understand about it. Pakistan is far behind in litracy because if we define literate person just peimry pass We will not achieve 50%rate.Govt take serios concern about this matter. Pakistan is far behind in litracy because if we define literate person just peimry pass We will not achieve 50%rate.Govt take serious concern about this matter. litteracy Rate in Sindh has actually gone down .we have conducted research in the sub urbs of Karachi. In last 5 years no of students in the Government Schools specially Girls has drastically gone down and No of Maderasa have increased. 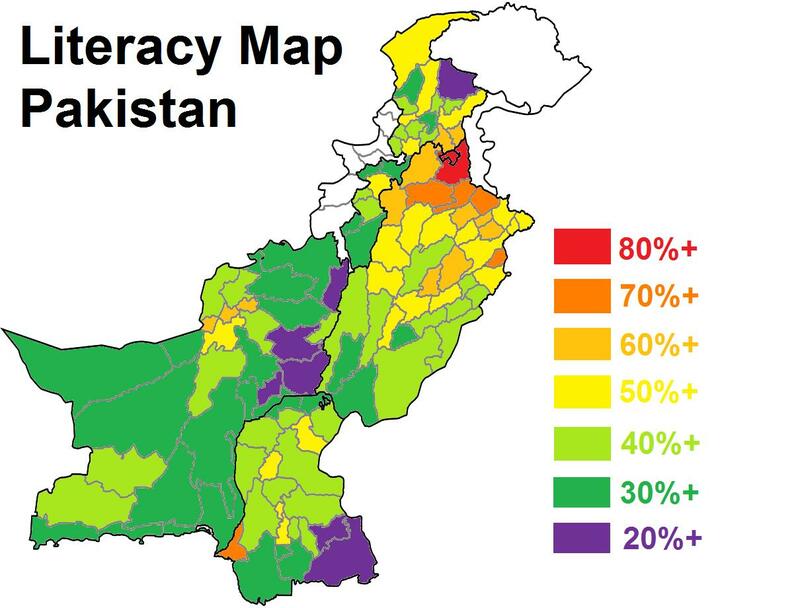 Pakistan should see to the literacy rate of Gilgit Baltistan, We have almost 100% literacy rate Alhamdu lillah. And we will keep it up, insha Allah. But what is comprehensive definition of literacy? Is just own name write considered literate person? Here we are not going to compare our areas with other one, we are a nation and Pakistan is our country, We have to think about its critical situation of education, What is allocated budget for primary education , in percentage ? Why elected and elected governments are not taking interest for increasing literacy rate. Even in 21sth century , most of schools in remote areas are “Ghost”. Inshaallah one day Pakistan literacy rate will be 100%. We Pakistanis have developed a habit of escaping the situation by saying “InshAllah”. Of-course only Allah can make this nation (if it is a nation) literate, otherwise, we Pakistanis are going to do nothing. first and foremost we make our education system more authentic so that 50% of literacy is also need some development phase to meet the global standard. If we do education free,scholarship,jobs,internships,technical education then illiteracy ratio will Automatically increases..! Education is the gateway of development of any country in every field. Maldives spending 8% of its GDP on education. Most of people here said inshahallah, but we must remember that it is the law of Allah, He never change the situation of a person or nation who never bother to change his or her situation. So be practical and be aware that Allah has nothing to do here but the nation has to. look at the figures, we are lower in education in the region except afghanistan. how can we go ahead with this ratio? only awaiting miracals? social and economic development is directly linked with the education and we are far behind. yet existing education is not quality education. Gilgit Baltistan kia Pakistan ma nahi ata ha. 59% are those who can write their names. only 35% are graduates…. 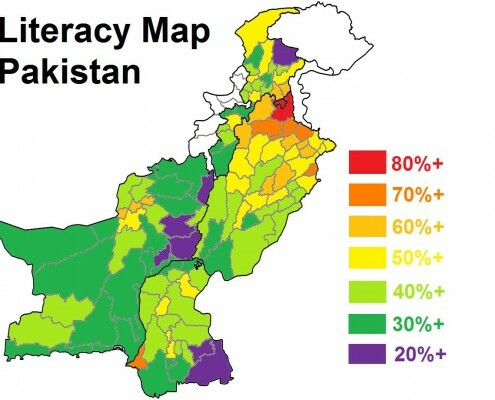 Except in Punjab the literacy rate has been decreased from 2012-2013 in other Provinces,especially in Rural Areas.How one day we will be to achieve 100% Literacy rate in Pakistan.Only Punjab Province is not Pakistan.The Federal Govt.should take the immediate notice of what is going in other provinces.why Provincs are not answerable.Should they continue their ill planning & looting Govt Exchequer in the name of Education. Why you people didn’t mention FATA. Is this not a part of Pakistan? pakistan ky sab province govts co chahy k wo balochistan k bahio k liy schools collages or univresty gift kary apny province k budget sy ta k wo hamry bhai b 50 70 90 % corss kary or ye inka haq ha …….. I AM CONTRIBUTING A NEW CONCEPT OF LITERACY AND THAT IS : WEIGHTED LITERACY. A PERSON ENGAGED WITH DRIVING AND WORKING AS A DRIVER HAS SOME SPECIFIC LEVEL OF LITERACY, A PAKISTANI SERVING ABROAD HAS SOME SOME LEVEL OF LITERACY THOUGH APPARENTLY HE IS WITHOUT SCHOOLING, A FARMER WHO CULTIVATES LAND IS NOT ABSOLUTELY ILLITERATE, SIMILARLY THE LABOR CASS WHICH IS ALSO VERY SIGNIFICANT IN THE LAND OF THE PURE MUST HAVE A PECULIAR TRAIT OF LITERACY…….WHY NOT WE ASSIGN WEIGHT TO THE SECTIONS OF SOCIETY AFTER A SCIENTIFIC SURVEY SO THAT WEIGHT-AGE MAY BE DETERMINED FOR THE MUCH NEEDED CENSUS EVEN AFTER 18 YEARS. Pakistan literacy rate will be 100% InshaaAllah, but it will be possible only when we all United and abolish the child labour and change their parents thinking. Pakistan spend only 1.7percent OF its GDP on education . It is too low according to UNO standard a country must spend 4 percent of its GDP on education. Hope Pakistan will be able to achieve United Nation UN given literacy target soon. Education is important for everyone rich or poor. There is dire need to bring educational changes in the country and bring educational reform in the counry….. I am not watching community wise, i means sectarian wise literacy rate in Pakistan & else where in all Islamic countries. Please if possible show this data also. Thanks.